For January’s Thankful Thursday, we’re celebrating the Australian Open and the incredible work they do through Tennis Cares. With passion, excitement and a lot of sunscreen, over 700,000 people gather Down Under to begin the year with world-class action. While it’s game, set, match for the tennis stars, Tennis Australia is going above and beyond the court to bring the community together and make a positive impact. 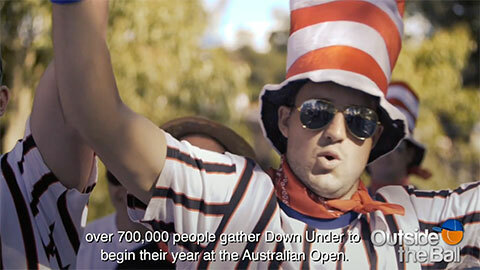 Getting the fans in on the fun, the AO Ball Drive allows attendees to take a piece of the tournament home with them. For a $2 donation, you can purchase a ball used in a Grand Slam match with the proceeds going towards the Tennis Cares initiative. Last year, over $24,000 was raised! Tennis families are also doing their part to spread joy at the Happy Slam! In support of Beyond Blue, tennis wives Kelsey Anderson, Abby Querrey, and many more united to raise funds and awareness for mental health. Tennis Cares and through it’s various initiatives provides a social contribution that extends well beyond the tournament. Targeting potentially-marginalized groups, they help organize festivals for indigenous Australians, promotes LGBTI inclusion, encourages participation among those aged over 65, and with the help of Aussie legend Lleyton Hewitt, supports the battle against motor neaurone disease with Fight MDB. So while cheering on your favorite stars on Rod Laver Arena, let’s also celebrate what happens when the tennis community joins together to help others! Visit www.tennis.com.au/about-tennis-australia/tennis-cares to learn more about how you can get involved.